Virginia International Raceway, VA, Friday 4th October 2013. 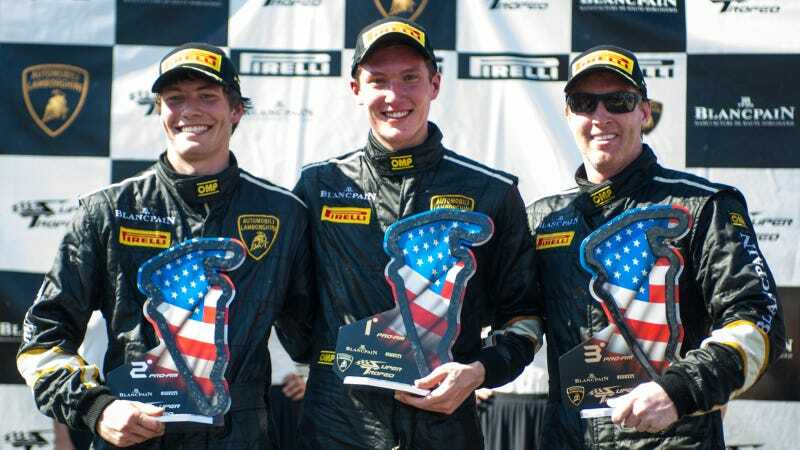 If yesterday was about experience triumphing over youthful endeavor, then today proved just the opposite in round 8 of the Lamborghini Blancpain Super Trofeo series at VIRginia International Raceway. Al Carter, representing Lamborghini Palm Beach/Mitchum Motorsports blasted into first past Bell on the start grid as the green flag dropped. The race changed dramatically on lap 5, as newcomer, Peter Strasser for Lamborghini Washington/Wisko Race Engineering, hit the tire wall, at the notoriously tricky S section through turns 8 and 9 at VIR. As the Lamborghini Aventador safety car was called out for three laps and came in just as the mandatory pit window opened on the 20-minute mark. With a number of the team strategies changing, it was the two young drivers, Montour and Palmer who emerged at the front of pack as the pit window closed. What ensued was incredible display of nose-to-tail racing. Separated by nothing more than 100th of a second, Palmer running in 2nd position was relentless in pressing and testing race leader, Montour. Behind the front-runners, the racing was just as hot. Yesterday’s winner, Justin Bell was forced to retire following damage to his front splitter, having traded paint the no.7 car, driven by Jeff Rodrigues, representing Lamborhgini Beverly Hills and GMG Racing. And with just two laps remaining, the pressure from Palmer told as Montour ran wide on turn 3, allowing his rival to sneak inside and move into the lead. Palmer did not look back and darted through to take his maiden victory, with Montour holding off Al Carpenter to take second and third respectively. The youth proved they have what it takes to listen and learn from the experience. Yesterday we thought the future is for tomorrow but Palmer and Montour have very much proved the future is today. With VIR wrapped up, Lamborghini moves onto Fontana in two weeks time for undoubtedly more thrilling race action.